Ctrl+Alt+Delete. It’s one of the first shortcuts every computer savvy/Windows savvy person learns, and it’s great for quitting a program that just won’t terminate when it’s told to. Doing the same thing on a Mac is a simple tap of the Apple menu bar icon and then reviewing the force quit menu. But if you want a “force quitter” app that’s got a bit more data associated with it, you might want to check out the free task manager and system usage review app System Lens. 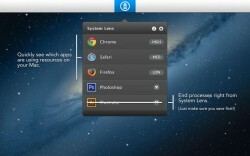 System Lens is a free Mac App that allows users to quickly review which apps are using up the most system resources. You can use this app to quickly terminate processes in order to free up system resources and get your computer to run better as a result. When you quit an application using System Lens, it will not initiate an auto-save in that app. Make sure to save your work before quitting a program. You can mess around with the basic settings in order to disable intermittent checking (great if you want to keep System Lens from being a resource hog) or disable sound effects. There are tons of customization options, which gives this app a great personal feel to it. Something interesting about this app is that it only monitors programs if they are running and active on your Mac. For example, Word would show up on the list of monitored items in System Lens if I had a window open…but if that window was minimized into my dock, it wouldn’t! Minimized windows still use up a bit of memory though, since the app is running. It’s not precise and comprehensive, but it is elegant, no? System Lens also has an interesting way of breaking down some of your usage info. For example, when running Safari with multiple tabs open, System Lens gave me readouts for Safari, Safari Web Content, and Safari Flash Content. I liked the way it broke things down a bit for some processes. 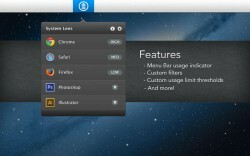 If you want a system usage monitor that looks great and functions well, this is a serious contender. It’s looks very elegant, hides up in the menu bar until you need it, and (best of all) it is a free app. I like that it has such a large degree of customization, and that it can be easily read from the menu bar without having to click on anything.